Complex maps are used for one-to many or many-to-one mappings, where you can specify rules and advices for the map execution as well as the level of generalization or specialization. One-to-many mappings are displayed in the table in separate lines (see screenshot). Complex map editor showing one-to-many mapping of "Accidental poisoning"
Snow Owl is capable to import the SNOMED CT to ICD-10 Cross Map Preview release under development by IHTSDO and the World Health Organization. Note that this cross map is still under development by the IHTSDO SNOMED CT to ICD-10 Mapping Workbench project group and they welcome your feedback. Since Snow Owl does not ship with ICD-10, an additional step is required to fully integrate the cross map with SNOMED CT and ICD-10. Once the ICD-10 release has been imported, the mapping can be updated with details from the ICD-10 release. This makes navigation easier, as instead of an identifier, the actual ICD-10 code and label is displayed with an associated icon to identify the top-level parentage. To start the update, right-click on the map and select Execute map target update. Select the terminology that should be used as the map target from the list. To map from SNOMED CT to ICD-10 or ICD-10-AM, you have to create a complex map type reference set. Use the button in the toolbar to launch the wizard. 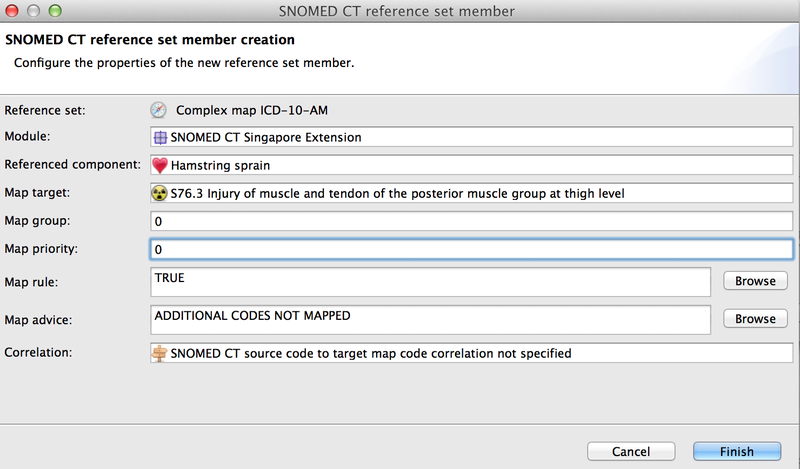 Choose SNOMED CT concept as the Referenced component type, and ICD-10 Class or ICD-10-AM Class as Map target type. Click Finish to create the map, it's now listed in the Reference set view. 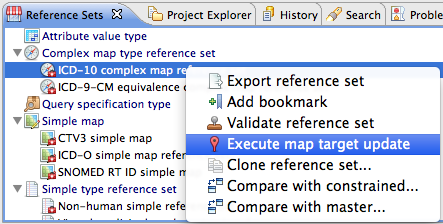 Now enter a search term for Map Target and select a target code. You can also enter a code ID (see screenshot). Besides these basic properties, you can select from a variety of pre-defined map rules and map templates and populate them with the appropriate SNOMED CT and ICD-10 identifiers that apply to the member. Quick search is available for Module, Map advise and Correlation, only valid results are displayed. Once you have finished your work, Save the complex map type reference set. Note: If you want to map from ICD-10 or ICD-10-AM to SNOMED, you need to create a Mapping set.